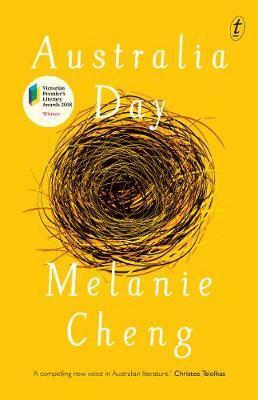 Australia Day is a collection of stories by debut author Melanie Cheng. The people she writes about are young, old, rich, poor, married, widowed, Chinese, Lebanese, Christian, Muslim. What they have in common-no matter where they come from-is the desire we all share to feel that we belong. The stories explore universal themes of love, loss, family and identity, while at the same time asking crucial questions about the possibility of human connection in a globalised world. Melanie Cheng’s short-story collection, Australia Day, won the Victorian Premier’s Literary Award for an Unpublished Manuscript in 2016, and is a wonderful feat of storytelling. Cheng is adept at creating diverse characters – young, old, Asian, Muslim, white, both blue- and white-collar workers – and putting them into situations where limits and relationships are tested, and there are no easy or politically correct answers. In the title story, Stanley, a young medical student from Hong Kong, travels with his friend and love interest, Jessica, to her family’s dairy farm for the Australia Day holiday. Stanley is acutely aware of his background; his recent Australian citizenship has only made him more conscious of his physical and cultural difference. ‘He’s going to hate me, isn’t he?’ Stanley asks about Jessica’s father, and Jessica’s ominous answer, ‘Deep down, Dad’s just a big, cuddly teddy bear’ sets the scene for Stanley’s hopes to be dashed over the ensuing trip. The notion of what it means to be ‘Australian’, or what it means to ‘belong’ is explored in every story. In ‘Toy Town’, Maha, a young mother from Beirut, feels acute loneliness and exhaustion in Melbourne. She takes her daughter to an indoor play centre and bonds with another mother, hoping their children’s shared play will lead to a friendship. Cheng’s background as a doctor also influences her writing. In several stories, medical or other health professionals treat patients with varying degrees of success. While the power imbalance between professionals and the clients they serve is demonstrated ably, Cheng intersperses other factors such as race, class and education to provide further complexity and drama. The 14 stories in Australia Day are as entertaining as they are thought-provoking. This collection is a great choice for book clubs, and students of the modern short-story form. Melanie Cheng is an exciting new writer.